Baroda Gujarat Gramin Bank (BGGB) has declared Final Result on 19th July 2015 on official website www.BGGB.in. 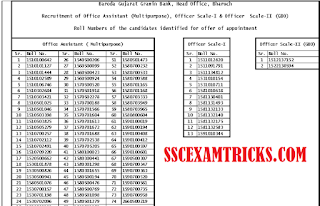 The BGGB Final Result has released for total 90 posts of Officer Scale I, Officer Scale II (GBO) and Office Assistant (Multipurpose). The Final Result has declared on the basis of performance of the candidates in written test and personal interview. BGGB appointment Offer Letter will be dispatched very soon to the individual candidates. The BGGB Final Result has declared. A list of selected candidates has published on the career page of BGGB’s official website. BGGB Final Result has released list of selected candidates for appointment / joining to the advertised posts. 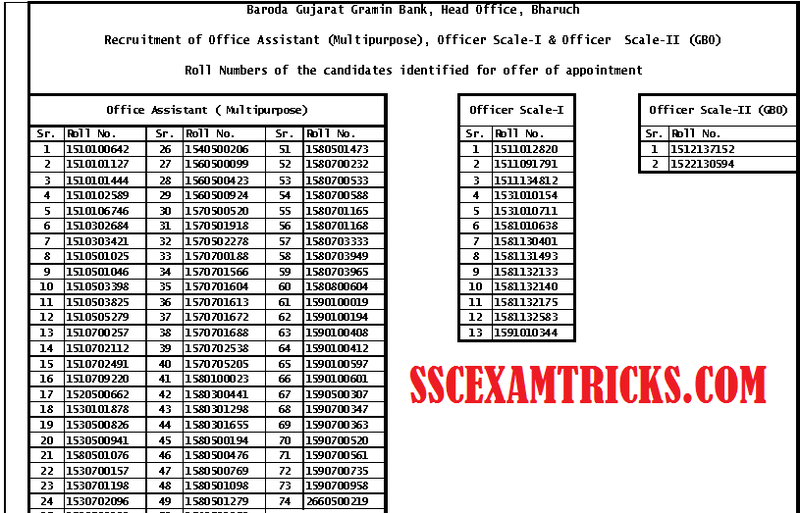 · BGGB Office Assistant Final Result - 74 candidates has selected for Office Assistants (Multipurpose) posts. · BGGB Officer Scale II Final Result - 03 candidates has selected for Officer Scale-2 (GBO) posts. The cut off marks list had published based on the performance in IBPS RRB CWE III held in September / October 2014. Those candidates, who had obtained marks above than category wise cut off mark, were called for personal interview. The date, time and venue of interview were mentioned in interview letter released by BGGB. · Photo ID & Residence Proof. · List of Certificates/ Mark Sheet. · Secondary Mark Sheet & Certificate. · Higher Secondary Mark Sheet & Certificate. · Graduation Mark Sheet Certificate. · Post-Graduation Mark Sheet & Post Graduation Certificate. · Caste Certificate – SC/ST/OBC: In case of OBC non creamy layer Certificate. · In case of PC/ PWD, Physically handicap Certificate as per norms. · No objection Certificate from previous employers with good character Certificate. Check Latest News of Appointment Letter / Joining Date/ Allotment Station of Selected Candidates on BGGB’s Official Link.